Research indicates that whole-body vibration can help people reduce back pain, lower the risk of bone loss, and increase strength. Want to start a fitness regimen or take your existing regimen to new heights? With a vibration platform machine, you can sit, stand, or lie down and enjoy a whole-body workout. A vibration platform machine transmits energy to the body, and by doing so, forces the muscles to rapidly contract and relax. As a result, a vibration platform machine delivers a complete workout. You're sure to find lots of vibration platform machines at your disposal, and selecting the right one may be difficult. Fortunately, the BestReviews team has evaluated some of the top vibration platform machines on the market today. We're here to provide key factors and features to consider as you shop for a vibration platform machine, buying recommendations, and much more. Design: Vibration platform machines are portable and easy to store at home, in an exercise or workout area, or in your office. Some vibration platform machines have non-skid feet to help keep the device in place, too. Weight Capacity: A typical vibration platform machine can accommodate an average-sized man, woman, or child. Although some vibration platform machines offer a weight capacity up to 330 pounds, you should never let two people use a vibration platform machine at the same time. Noise: If you plan to use your vibration platform machine while you watch TV or listen to music, you should search for one that runs quietly. Vibration Speeds: Certain vibration platform machines offer vibration speeds from 1 to 199, allowing you to adjust the intensity of your workout. A vibration platform machine's features are key differentiators, and they may help you distinguish an extraordinary vibration platform machine from an ordinary one. Now, let's examine some of the key features to consider as you shop for a vibration platform machine. Remote Control: If you pick up a vibration platform machine that includes a remote control, you can quickly adjust the device's vibration speed any time you choose. Wheels: Some vibration platform machines feature wheels for seamless transport. LED Display: A vibration platform machine that offers an LED display allows you to track your workout time, calorie burn, and other exercise data. Color: Various vibration platform machines are available in bright colors. Meanwhile, others are sold in subdued tones to match the décor in a home or office space. Vibration platform machine prices usually range from as little as $100 to $300 or more. Keep in mind, however, that using a high-priced vibration platform machine does not guarantee that using the device will help you instantly achieve a ripped, toned physique. Vibration platform machines priced around $100 are usually sturdy, durable, and ultra-thin. They are commonly sold in different colors and offer dozens of vibration speeds. The mid-tier price range for vibration platform machines includes machines priced between $100 and $300. These vibration platform machines are sometimes sold with exercise guides that include photos and descriptions of different workouts you can perform on your machine. They may also include a manufacturer's warranty. Vibration platform machines priced above $300 often promote improved blood circulation and enhanced weight loss. These machines frequently include a powerful motor and preset programs, among other features. Even spending 10 to 15 minutes per day at least three days a week on a vibration platform machine may help a person lose weight and build strength. Plus, when a person uses a vibration platform machine regularly and maintains a healthy diet, this individual may be better equipped than ever before to achieve his or her long-term fitness goals. Q. Do I need to be in shape to start using a vibration platform machine? A. Vibration platform machines are intended for users of all fitness levels. By using a vibration platform machine, you can work out at your own pace to get in shape or improve your current shape. Q. What types of exercises can I perform on a vibration platform machine? A. A vibration platform machine allows you to work out your abs, thighs, buttocks, calves, and other parts of your body. It allows you to perform different lower body, upper body, and core workouts, and as such, represents a terrific exercise option for athletes and non-athletes alike. Q. Does a vibration platform machine actually work? A. Research indicates that whole-body vibration helps increase muscle strength and weight loss. Additionally, some fitness experts say using a vibration platform machine for approximately 15 minutes per day, three days a week can help individuals trim fat and improve blood flow. Our take: This vibration platform machine offers everything you need to enjoy a full-body workout. What we like: Includes two detachable resistance straps so you can perform a wide range of arm and upper body exercises. Offers 180 speed adjustments. Features an easy-to-use LED monitor that displays time, pulse, BMI, and more. What we dislike: Pricey in comparison to similar vibration platform machines. Our take: This vibration platform machine delivers a great combination of affordability and durability. What we like: Sold in multiple attractive colors. ABS shell delivers outstanding strength and versatility. Includes four suction cups to increase stability. What we dislike: Much louder than comparable vibration platform machines. 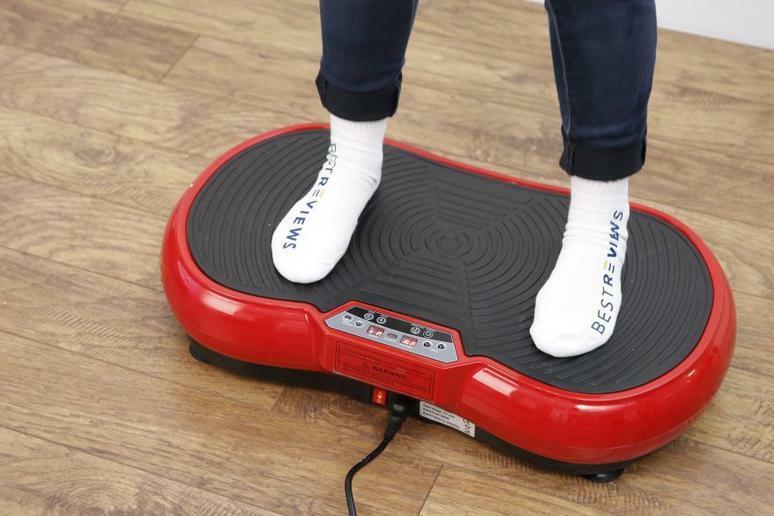 Our take: This vibration platform machine offers a wonderful option for both fitness gurus and those who want to start a workout or exercise regimen. What we like: Weighs only 33 lbs., so you should have no trouble transporting the machine as needed. Includes a handy remote control so you can adjust the machine's speed with the push of a button. What we dislike: Offers only 20 speed settings, which pales in comparison to similar vibration platform machines.